I have a very deep affections for Archie's Superhero characters and while I wish the Remco Mighty Crusader's line was better, I do realize this is the first and possibly only action figure line I'll see in my life time. Characters like The Web, The Fox, the Comet and the Shield have never really been household names sadly. This is from the 1985 Remco catalog and there are some awesome things in it that I will share in the coming weeks. These are awesome. 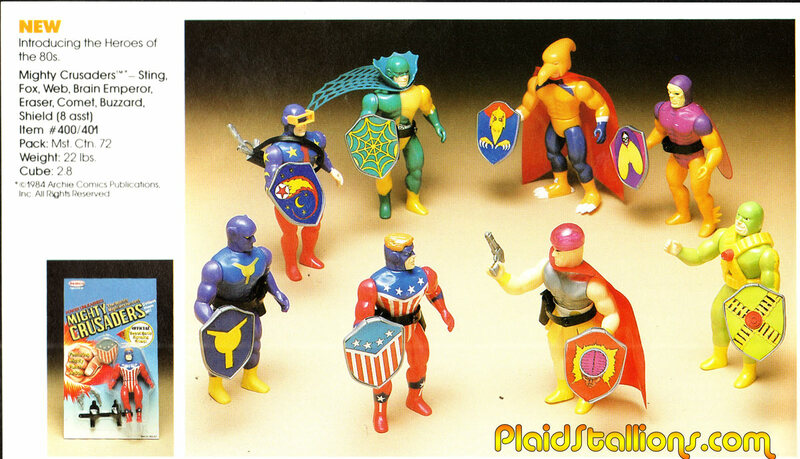 I wonder if the use of shields was to copy the Marvel Secret Wars figures (who also all came with shields for some inexplicable reason). I remember seeing these at K-Mart as a kid and not wanting them because I had no idea who they were. Now I want to slap around my younger self for that. I've grown into a major Archie Comics fan over the years since. And of these characters especially. I even had one of my fan art drawings of Brain Emperor published in their short lived New Crusaders comics a couple years ago. Oddly enough, we didn' have these in Italy, but we did have the wonderful line of DC comics action figures (Warlord, Warrior beasts, Arak etc. ), altough those comics were NOT published here (if I remember correctly). I guess they were considered just a cool fantasy line, and we were still in the "Masters of the Universe" craze, more or less. Like the Sungold things, those were mostly sold in newsstands and outdoor markets and were relatively cheap. Yeah I remember these things coming out and thinking they were Remco's cheap-o take on Super Powers or Secret Wars, and I didnt learn till many years later that they were golden age characters and that Ditko had done some of the card art. I remember my nephew getting The Web for Christmas one year in the mid '80's and me being a strict Marvel fan, looking at it and thinking, "What the hell is that?" Go Exploring with BIG RED!